I always like going into A.S. King's books blind and I'm always so incredibly blown away by the story that I experience - this book was no exception. 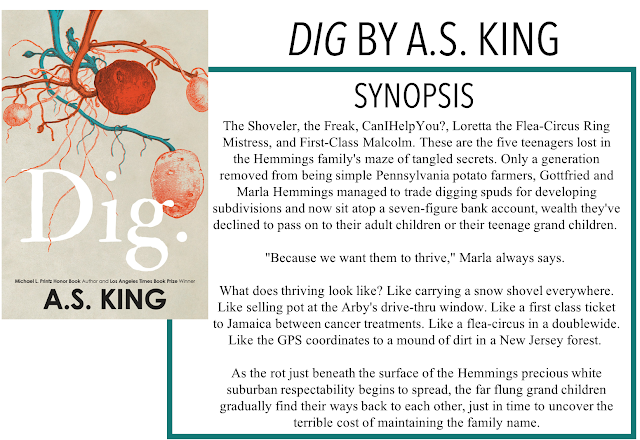 I am back with another book review, Dig by A.S. King. This book follows the Hemmings family, including The Shoveler, the Freak, CanIHelpYou?, Loretta the Flea-Circus Ring Mistress, and First-Class Malcolm. Each of their lives is connected to the others, but we don't know just how until closer to the end of the book. I don't really want to say too much about the plot because I like going into King's books blind but I will say that at its core, this is a book about privilege, race, and today's society. As I went into this book blind, I didn't really clue into the white supremacy component until it really became prevalent in the book. And even then, I was unsure as to if I was just reading too much into the story. It wasn't until after I finished it that I read the jacket synopsis and saw the note from King at the end discussing how this book is supposed to make us think about and be aware of racial tensions. Despite never really having ever read a book that was so forward about the topic, I thought it was really well-done. In typical King style, you're just kind of along for the ride. The story will go where it goes and the characters will do their thing until the end when everything comes together. That's what I love about King's books - they seem like they're all over the place but after you finish it, you realize that King has extremely skillfully woven together this story with a powerful message behind it. The writing is so visceral, I felt like I was right alongside the characters every step of the way. Also, just as a side-note: the cover made no sense to me until I read it and then I was like "Oh, okay, they are potatoes... and the roots are veins because of the thing with the blood, and symbolism, etc." Very clever job, cover designer, very clever indeed. Despite the fact that there are a number of characters in this book and most of them don't share their names with the reader - which is just so distinctly King - you never get them mixed up because each and every character has a very different outlook on life, a different way of thinking, and a different voice. Each one is really interesting and I didn't have the issue I sometimes do when reading a book from multiple perspectives where I like one or two more than the others. I really enjoyed each perspective equally. Overall, this is a great introduction to King's style if you're new and a good continuation if you are a long-time fan like myself.